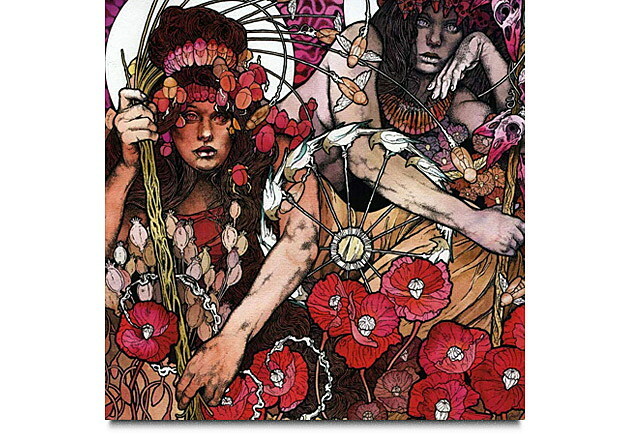 Reading an interview with John Dyer Baizley (artist, and Baroness lead guitarist) made me recall just how often I studied his cover for Baroness’ Red Album while writing Darklands. I can’t even pinpoint what it is about that painting that speaks to me so eloquantly. The first thing that strikes me about it is that it’s fairy land – the sinster and cruel fairy land of Susannah Clarke’s Jonathan Stange and Mr Norrel. But also the mysterious and magical fairy land of Neil Gaiman’s Stardust. The disc of bound birds are reminiscent of the Fates spinning their wheel, and the threads of human life, indiferent to desires or pleas. The poppies suggest a drugged, dreamlike hyperreality. Some of them spew strings of white… stuff. Milk of the poppy, I guess. But coupled with all those phallic looking insects and the tadpole-shaped patterns in the background, suggest other stuff too. The painting is beautiful, and horrific. The two women seem at once bored, indifferent, judgemental, powerful, dangerous, sexual… but likely to have the appetites of preying mantisses. Their cold, dead eyes look out at you with no mercy, their muscular arms at odds with their vulpine, vampiric faces. Perhaps that is the crux of fairy land? That intoxicating mixture of allure and danger? Knowing that you should stay away, but helplessly drawn in by the beauty and wonder?